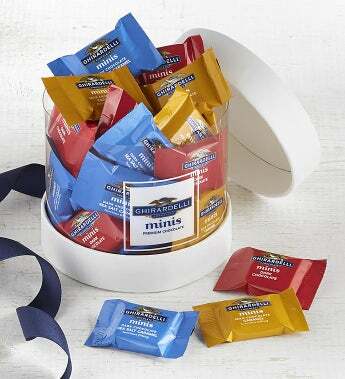 Ghirardelli's iconic chocolate squares in mini size fill this stylish hat box gift. This 40 piece assortment includes Milk Chocolate Caramel, Dark Chocolate Sea Salt Caramel, and Dark Chocolate. These minis are the perfect size when just a small chocolate indulgence is needed and are also ideal for sharing at a party.